Referred to as The Five Love Languages for money, The Seven Money Types helps readers identify how God has wired them to think about, feel toward, and handle money and how that knowledge affects their financial well-being. "True financial well-being involves more than getting out of debt and accumulating wealth.. It's about discovering how you're wired by God, and how that wiring influences the way you think about, feel toward, and handle money," says financial development strategist Tommy Brown. This unique book draws from Brown's years of experience in pastoral ministry and money management. The culmination of seven years of development work, The Seven Money Types complements practical financial programs to help readers experience financial freedom that goes beyond the bottom line. 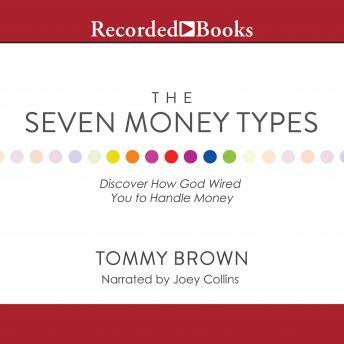 As Brown reveals the seven money types found in the "Seven Shepherds" of Scripture, he helps readers identify their type by means of a 35-question assessment. Whether they are an Abraham (hospitality), an Isaac (discipline), a Jacob (beauty), a Joseph (connection), a Moses (endurance), an Aaron (humility), or a David (leadership), Brown coaches individuals in understanding, affirming, developing, and enjoying their unique approach to money. This journey of self-discovery reduces internal struggles, brings greater understanding and appreciation of others, and improves relationships.